World Contact Day is an annual observance held on March 15. It was established in 1953 by the International Flying Saucer Bureau (IFSB). 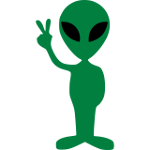 The IFSB was founded by Albert K. Bender, a former US airman who was obsessed with the UFO phenomenon and devoted himself to UFO research. He created the organization in 1952, and a year later its members voted for the creation of World Contact Day. On March 15, people who want to make contact with an extraterrestrial intelligence attempt to send a telepathic message into space. IFSB members are convinced that if many people focus of an identical message at the same time, they may be able to telepathically transmit it through space (given that both telepathy and alien civilizations do exist). The original message which people focused on during the 1953 World Contact Day included assurances of friendly intentions and requests to make an appearance on Earth or at least give a sign that the message was received. World Contact Day is not the only awareness day observed by people who are interested in unknown flying objects. They also celebrate World UFO Day which has two possible dates – July 2 and June 24. On the occasion, people gather together and watch the sky for UFOs.